What do you guys think of liquid peels? The Body Shop have recently unveiled their new range of liquid peels which is so perfect for removing pollutants and dead skin cells. With continued use, you can look to expect smoother looking skin. If you're aiming for a smoother and more luminous complexion, have you tried liquid peels before? How it works is that it uses a gel to peel technology which looks to trap and gently peel off any impurities, pollutants and dead skin cells. They're a great way to achieve a deep exfoliation skin treatment twice a week. 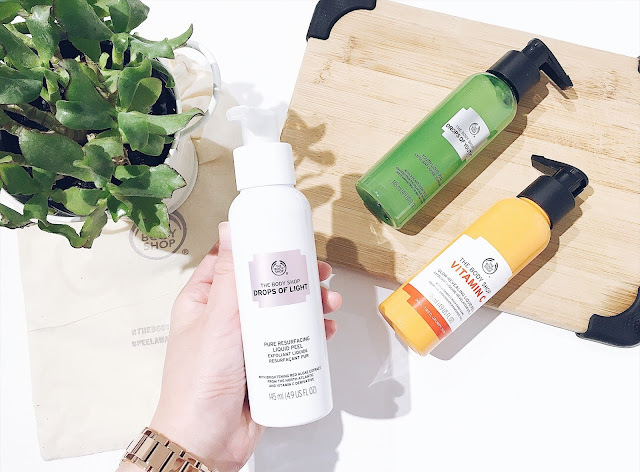 The Body Shop have released three liquid peel products which I've tried out recently which includes their Drops of Youth Liquid Peel, Glow-Revealing Liquid Peel and Pure Resurfacing Liquid Peel. All of the Liquid Peel products are colour coded so that you know which particular product you are dealing with and they come with a pump feature, making it convenient and easier for you to use. To hear more about my experiences with the Liquid Peels by The Body Shop range, simply scroll down. This product a liquid peel which looks to exfoliate your skin in the most gentlest way. The gel peel works by lifting any impurities, dirt and oil trapped underneath the skin and allowing your skin to breathe as well as allowing it to feel much smoother and softer. My skin felt wonderfully cleansed and so purified after using this the Youth Liquid Peel for a few weeks now and it also helps you to achieve a healthier and glowing complexion. How I would look to use this liquid peel is by dispensing 2 pumps of the Youth Liquid Peel onto my fingertips and looking to work this onto dry skin until you start to see the clumps to form. Next, rinse off your face by using warm water and look to pat the skin dry to reveal a fresher and more supple skin appearance. Overall, it's a ideal liquid peel to use if you have dull and flaky looking skin. I love how this product works to rid any dead skin cells which means that your make-up goes on smoother during application. It's better to prepare the skin first before looking to paint your face on! This product contains brightening red algae extract as well as Vitamin C derivatives present in its formula. If you are after a product that looks to smooth out your skin's complexion and brighten it up, then you may be interested in their Pure Resurfacing Liquid Peel. Within the first use, I found that my skin looked so much brighter in its appearance which is great if you after more luminous and glowing looking skin. The Liquid peel certainly looks to refine your skin's texture by making it feel more smoother and softer. Just like the Youth Liquid Peel, it's an amazing product for unveiling healthier looking skin - the only difference is that by using the Pure Resurfacing Liquid peel you will find your skin looking so much brighter. It's a great product for winter because this is where our skin starts to become dry and flaky. With continued use of this particular product, you can ensure that your skin stays refreshed and revived for longer. If you're experiencing dull and tired looking skin, then this liquid peel which contains Vitamin C can look to solve your problem. It leaves your skin feeling invigorating, energizing and refreshing. How this peel works is that it acts as a gentle exfoliator looking to trap and lift off the surface dead skin cells and pollutants which leaves your skin glowing for the longer run. It's also ideal for preparing the skin for make-up application so that your foundations and concealers go onto the skin smoother and better. This particular liquid peel is suitable for those who are wanting to reduce acne/blemishes, signs of ageing as well as sun damage. After using this liquid peel, I can really definitely note more of a radiant appearance and my skin just looked so much healthier again. It really helps your skin to breathe which is essentially my ideal skincare product to use every week. 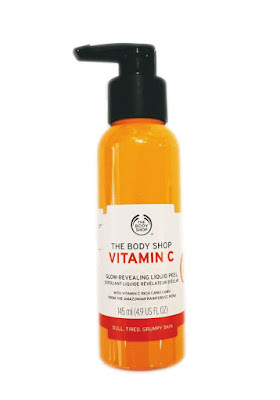 What are your thoughts on the Liquid Peel range by The Body Shop?